The Silent Shadows Wolf Puzzle has the beautiful artwork of James A. Meger. 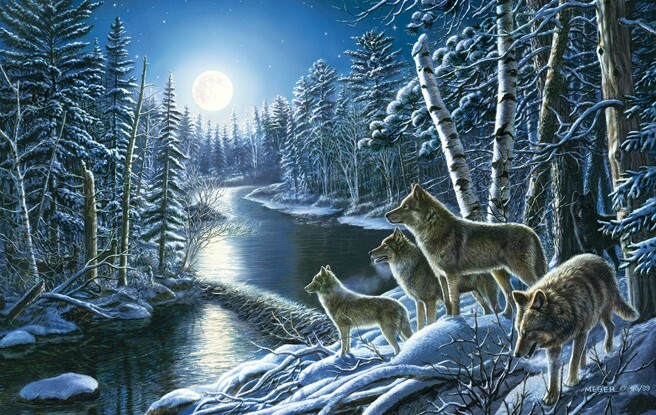 The scene is of a pack of Wolves on a snow covered river bank on a moonlit night. It is truly breathtaking. This Wolf puzzle is 100% made in the USA using eco-friendly, soy-based inks on recycled board. They puzzle comes nicely boxed with a picture of the puzzle on the cover. This would make a fantastic gift for a Wolf lover or puzzle enthusiast.